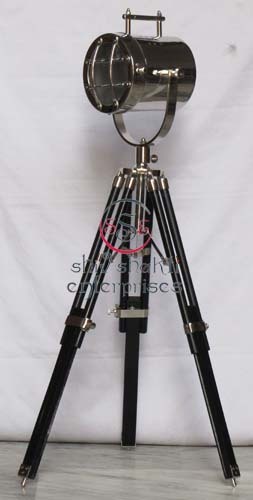 Huge Woking Spot ﻿Search Light with Tripod Stand.It Comes with Electric Fitting. This is beautiful search light is use for room corner & photography and focus some one also.﻿Light & Stand is made of Aluminum & Stainless Steel. We have lot of Table Lamp.﻿ ﻿It is used for Home Decoration, office use, Table Top etc.﻿﻿Light is made of aluminum & Stand is made of Timber & aluminum.﻿Good Quality Products﻿.It comes with Electric fittings. All work is totally hand made. Nauticalt Floor Searchlight with Tripod Here is Great nautical spot search light Nice Heavy Quality Spot light marine collection. This is beautiful search light is use for room corner & photography and focus some one also. We have lot of search light.﻿ ﻿It is used for Home Decoration, office use, Room Corner etc.﻿﻿Good Quality Products﻿.It comes with Electric fittings. All work is totally hand made.This Studio Lamp is also used in photography. We have lot of search light.﻿ ﻿It is used for Home Decoration, office use, Room Corner etc.﻿﻿Good Quality Products﻿.It comes with Electric fittings. All work is totally hand made. It is used for Home Decoration, office use, Room Corner etc.﻿﻿ ﻿Good Quality Products﻿.We have lot of search light.﻿ It comes with Electric fittings. All work is totally hand made. 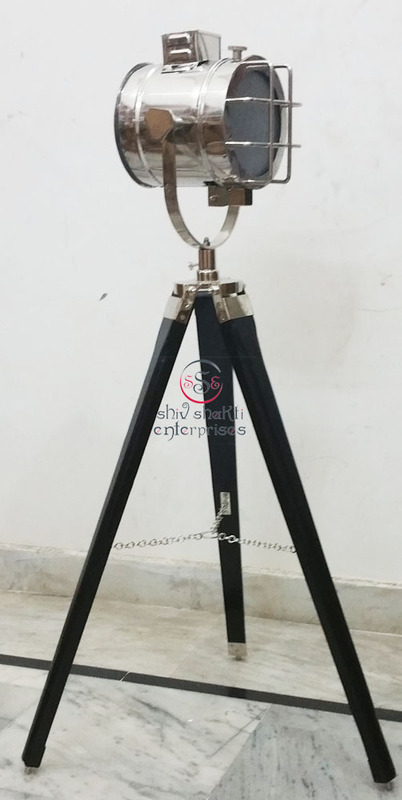 It is used for Home Decoration, office use, Room Corner etc.﻿﻿ Light is made of aluminum & Stand is made of Timber & aluminum.﻿Good Quality Products﻿.We have lot of search light.﻿ It comes with Electric fittings. All work is totally hand made. 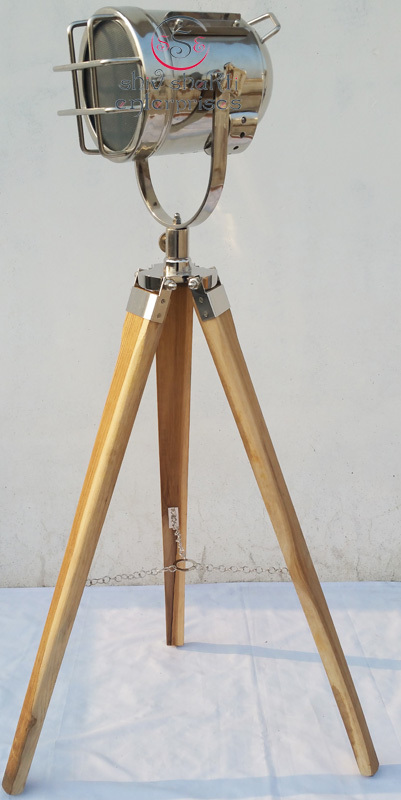 Nautical spot light with Tripod Here is Great nautical spot search light Nice Heavy Quality Spot light marine collection. This is beautiful search light is use for room corner & photography and focus some one also. We have lot of search light.﻿ ﻿It is used for Home Decoration, office use, Room Corner etc.﻿﻿Good Quality Products﻿.This Studio Lamp is also used in photography.﻿It comes with Electric fittings. All work is totally hand made. 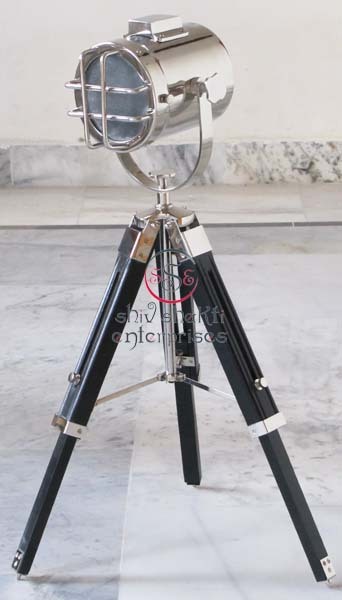 This is beautiful search light is use for room corner & photography and focus some one also.Huge Working Spot ﻿Search Light with Tripod Stand.It Comes with Electric Fitting.﻿Light & Stand is made of Aluminum & Stainless Steel.